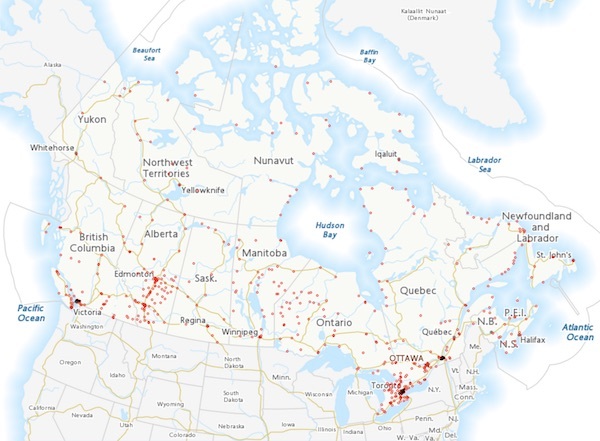 LaserPointerSafety.com has additional information on the number of laser/aircraft incidents in Canada on (scroll down on this page), and a comparison with U.S. incident rates. 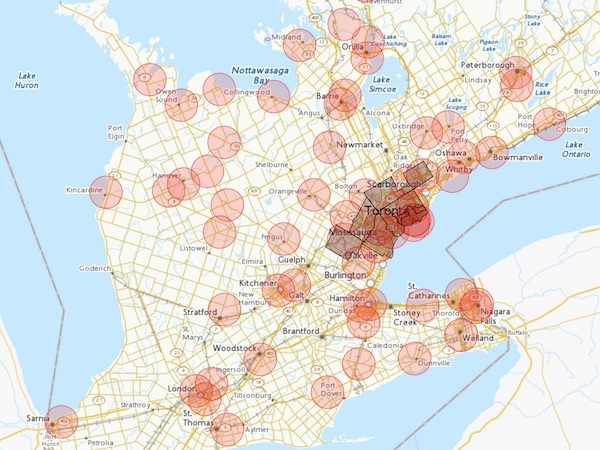 We also have news stories about laser illuminations of aircraft in Canada, about non-aviation laser misuse in Canada, and about Canadian statistics and laws and other laser news. Those interested in existing Canadian laws about laser misuse can find them here. The June 28 2018 restriction comes after disappointing results of efforts to educate Canadians about the hazards and illegality of aiming lasers at aircraft. The number of incidents rose to around 590-660 in 2015, despite the education campaign. On May 24 2016, Marc Garneau announced the awareness campaign would extend to social media as well. This may have helped the reduction in 2016 (527 incidents) and 2017 (379 incidents). The education efforts were not deemed sufficient by Garneau, who on February 15 2018 announced that Transport Canada would explore “all possible options” to reduce the number of laser/aircraft incidents. In his June 28 2018 announcement of the restrictions, Garneau noted that laser incidents had dropped 25 percent in the past two years, but said “It's still too many. We want it to be zero. The education is working, but it's not working fast enough." But this is incorrect. In the vast majority of laser/aircraft incidents, perpetrators are never found, arrested, prosecuted or convicted. One reason may be the low rate of arrests and convictions. A 2014 study by Cyrus Farivar, summarized here, found that in the United States, less than 1% of reported laser/aircraft incidents led to an arrest, and less than 0.5% of incidents led to convictions. LaserPointerSafety.com is unaware that this situation has improved since 2014, either in the U.S. or in Canada. Australia’s experience with a 2008 ban on laser pointers over 1 milliwatt indicates that a ban will not be effective, at least not for many years. 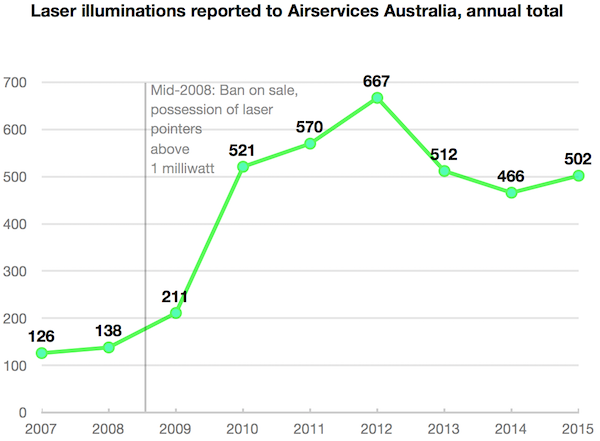 The chart below shows how laser illuminations of aircraft rose significantly the four years after the ban, and settled down to a rate that seven years later is still 350% higher than the pre-2008 incident rate. In addition, because of the restrictions, many lasers imported into Australia have labels falsely stating they are below 1 milliwatt while tests show they are significantly higher. An Australian safety expert wrote "...the prohibition laws may have detrimentally affected laser pointer safety within Australia without overtly impacting availability....the one thing more hazardous than a correctly labelled high power laser pointer is a high power laser pointer labelled as safe." While bans and restrictions may help somewhat over many years — perhaps a decade or more — no one should think that pilots will be safer and can relax once a ban is in place. Here are three reasons why: 1) Even 1 milliwatt lasers can be a vision-blocking hazard at close (hovering helicopter) range, 2) higher powered lasers will remain readily available to persons who want them (pre-ban lasers, purchases on the Internet or when visiting other countries, making their own, using external power sources with non-battery lasers), and 3) this will not dissuade any “bad guys” who might deliberately want to aim laser light at aircraft for crime distraction or to cause direct harm. LaserPointerSafety.com believes that while bans could help, the single best counter-measure is mandatory pilot education and training. The “last line of defense” is the pilot. Fortunately, a laser threat is only light — not a bullet or missile. Pilots who know not to panic, and how to respond, can safely control their aircraft even after a bright, flashblinding exposure. SAE ARP6378, published June 2 2018, details the procedures and education that pilots should have. It also discusses when and what type of laser glare protection should be used.